A veneer is a thin layer of porcelain made to fit over the front surface of the tooth. Sometime, a natural composite material is used instead of porcelain. It can improve the colour, shape and position of teeth. 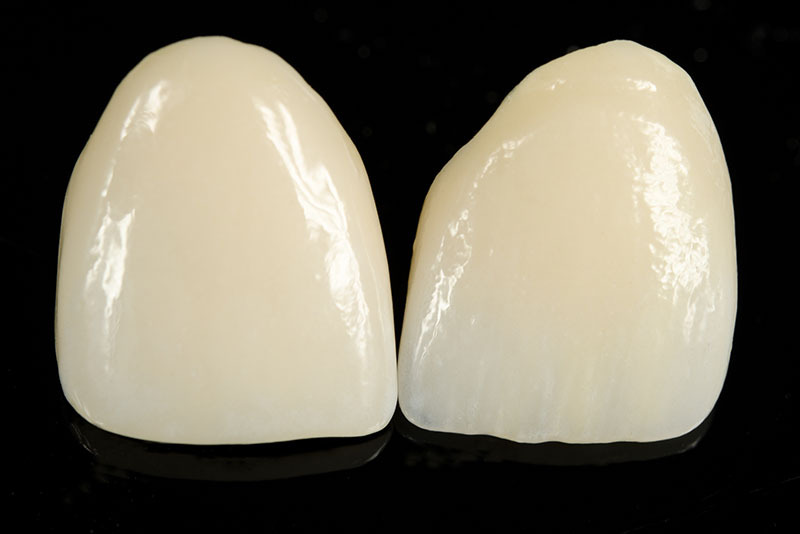 A precise shade of porcelain can be chosen to give the right colour to improve a single discoloured or stained tooth or to lighten front teeth. We use the finest porcelain veneers available to restore crooked, damaged, or discoloured teeth. A veneer can make a chipped tooth look intact. It covers the whole front part of the tooth with thicker surface replacing the fractured part. Veneers can be used to close small gaps, if orthodontic treatment is not suitable. If one tooth is slightly out of position to the rest, a veneer is sometimes fitted to bring it in line with the other teeth. Veneers make the teeth look natural. Because they are very thin and are held in place by a special bond, very little preparation of the tooth is required. Some of the shiny outer enamel of the tooth may be removed to make sure that the veneer can be bonded permanently in place mater. The amount of enamel removed is tiny and will be the same as the thickness of the veneer to be fitted, so the total stays the same size. A local anaesthetic (injection) may be used to make sure that there is no discomfort, but often this is not necessary. Once the tooth has been prepared, the dentist will take an impression (mould). This will be given to the dental technician, along with any other information needed to make the veneer. The colour of the surrounding teeth is matched on a shade guide to make sure that the veneer will look entirely natural. A veneer takes at least two visits: the first to prepare the tooth and to match the shade, and the second to fit it. Before bonding it in place, you will be shown the veneer on your tooth to make sure you are happy with it. Bonding a veneer in place is done with a special adhesive, which holds it firmly on the tooth.